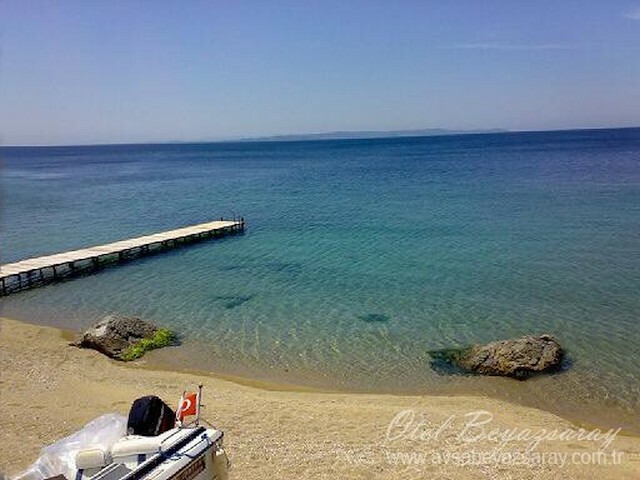 THE CLOSEST HOLIDAY REGION TO ISTANBUL, AVSA ISLAND 3 HOURS BY IDO ! Hotel is Tourism Management Certified and has 2 Stars. Avsa Island is with its’ clean air with much oxygen, brilliant water, granite sand, delicious fish, wine, music and joyfull nights, the most beautiful among the islands of the Marmara Sea. Avsa Island is a holiday region, which got famous for right due to its’ sea shore, decorated with silverberry and olive trees, the increase of transfer easiness and the festivals organized by the Municipality of Avşa Island during August each year, which got traditional. Avsa Island is expecting you with its’ clean, affordable hotels, pensions and lodging opportunities. Beyaz Saray Bay is an untouched lunate bay with a brilliant sea, a green environment, which is located 2,5km from the IDO-Pier (Istanbul Sea Busses). 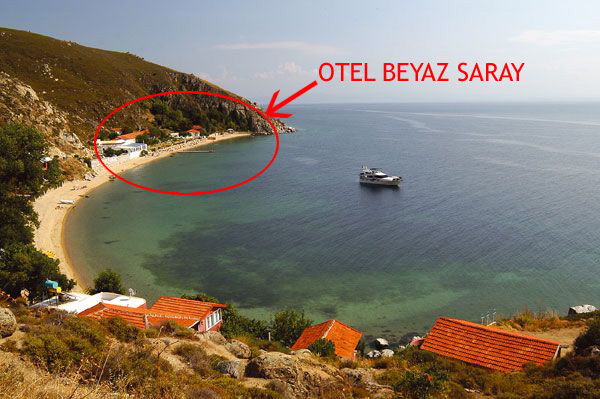 There are 2 islands with a granite-sand shore on the world, and one of them is the Beyaz Saray Bay on Avsa Island. It is known, how beneficial granite-sand is for health, suggested by praticians to their patients for treatment purposes. At Ekşi Sözlük (A domestic dictionary forum on the Internet) Beyaz Saray Bay is described as “Located in Avsa Island, went down by stairs, a hill on the back, an endless sea in front, a kind of miniature of the Butterfly Valley to be able to defined bay; it has won the hearts by its’ tiny pier, its’ palms and its’ sea-shore”. 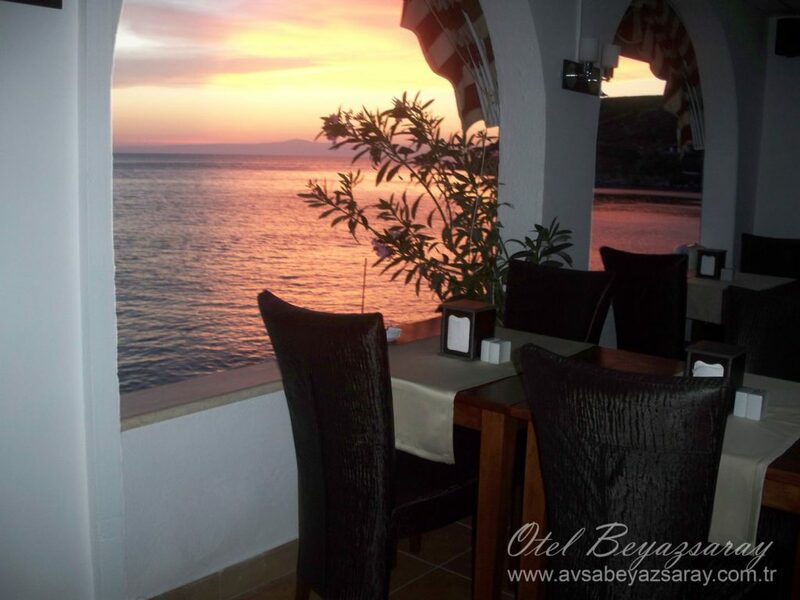 At Beyaz Saray Bay, there are three holiday cottages except the Beyaz Saray Hotel, it is the only lodging opportunity at the bay. 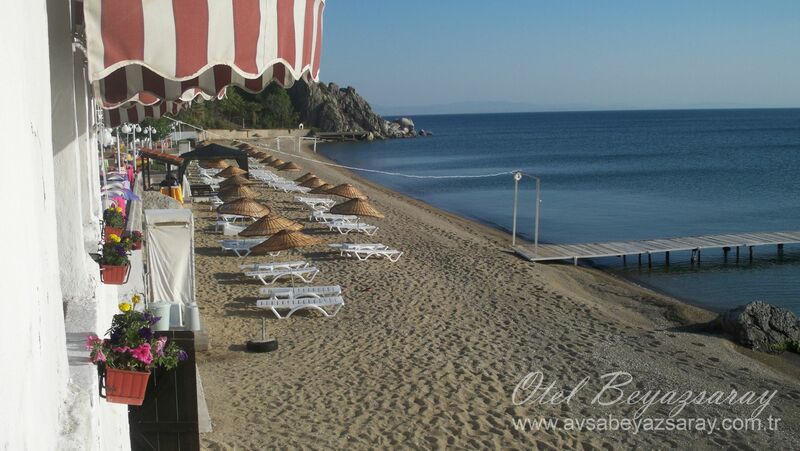 The private beach for the guests of the Beyaz Saray Hotel is awaiting you with its’ pure sea, of which the waves, the stars are twinkling to, whispering sounds of friendship, its’ large granite-sand strand. 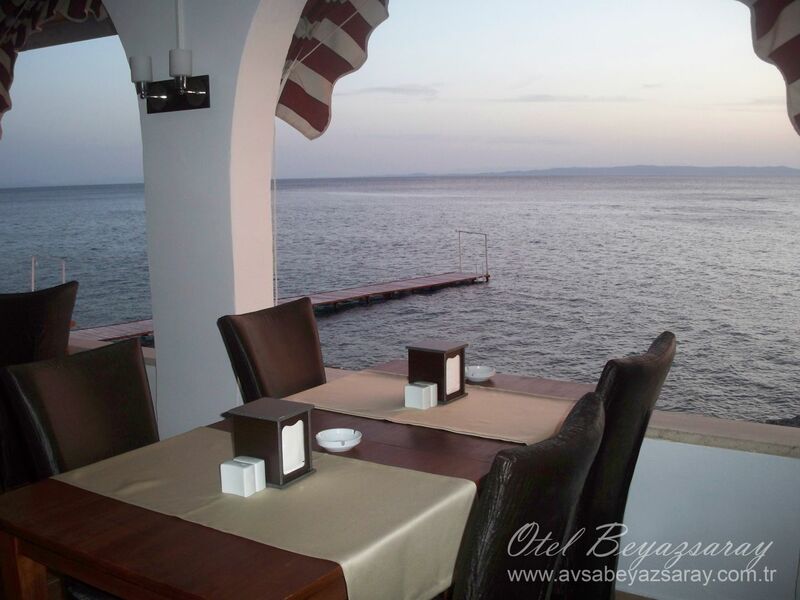 The evenings at the Beyaz Saray Bay of Avsa Island are somehow differently nice. The red, created by the leaving sun on the sea, is reflected on the whole bay. And finally it gets evening, the darkness surely rises over. This is the sign of the beginning of another life at Beyaz Saray Bay. The sounds, overrunning from every corner to the garden and the bay, cause heartbeats of vacationers. The blaze of thousands of stars accompany the rythm of the music. At nights with moonshine, the moonlight-shadows carry the guests away, their memories mix with the blazes. …and among all these beauties, it would not be an embroidery to say that 2 days are lived within 24 hours at Beyaz Saray Hotel. So, you should also come to this heavenly bay, and live one day from daybreak to sunset, and another day from sunset on. Open buffet breakfast, open buffet dinner..
LCD TV with satellite at rooms. Free wi-fi internet at lobby and restaurant.